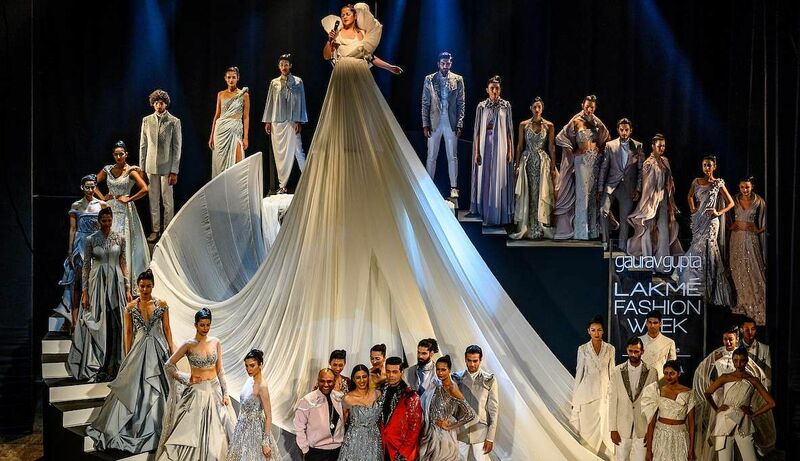 At Mumbai’s Royal Opera House last Tuesday, designer, Gaurav Gupta presented an opening show packed with drama, dance and exquisite craftsmanship, that set the tone for the Lakme Fashion Week Summer / Resort 2019. Aptly titled (Un)folding, the collection he showcased was another reminder of his signature draping and origami techniques. As always, the Gen Next show the next day proved to be promising with exciting new talent offering fresh takes on resort wear. The Circular Design Challenge, an award for sustainable fashion in India, saw Mumbai-based I Was A Sari walking away with top honours while other initiatives like Sustainable Development for The North East India Project (which empowers rural women artisans) ensured the six-day event was an action-packed affair. With designers like Raghavendra Rathore, Pero, Varun Bahl, Shivan & Narresh, Gauri & Nainika and Sneha Arora returning to LFW, there were also a number of trends that emerged out of the fashion extravaganza. “A symphony of artisanal values, our heritage, and our rich cultural roots brings together a collection that is called “An Ode To The Bandhgala”, The Indianization of Fashion, where primitive values connect with a modern expression of fashion,” said Raghavendra Rathore of his collection, which was modeled by Anil Kapoor, Ranveer Singh and Jhanvi Kapoor. From tiered dresses to exquisite lace and quilted accents, we identify the biggest trends from LFW S/R 2019. Designers Shriya Som and Anita Dongre included a healthy dose of tiers into their silhouettes, giving their garments a playful, fun vibe. While Shriya’s defining look was a bit more dressy with a floor-length tiered tulle gown, Anita went for a relaxed vibe with a long kurta featuring Mughal-inspired botanical prints on Tencel fabric. Nikhil Thampi’s love for androgynous silhouettes was reflected in his collection, titled Semi Colon. While a palette of browns was the order of the day, it was his use of metallic silver on jumpsuits, gowns and maxi dresses, that really turned heads. 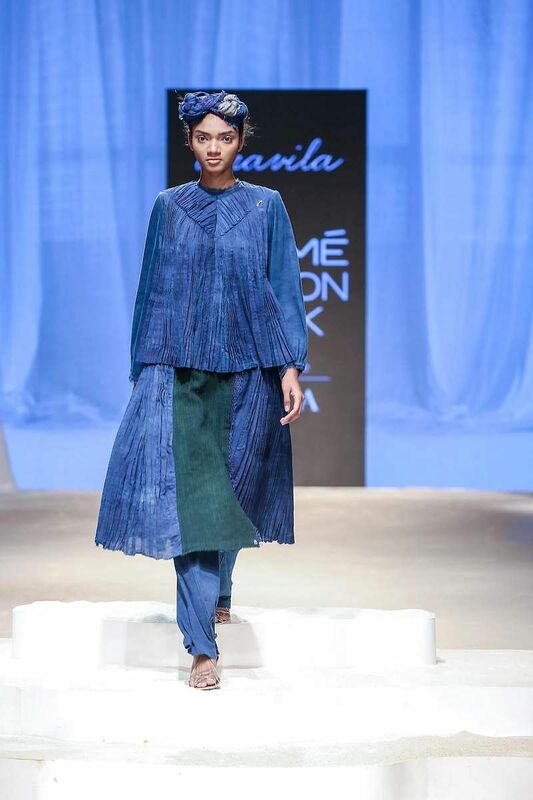 Micro pleating continues to be a favourite with Esse Label, Anavila Misra and Bodice Studio including it in their design story. Esse by Sahib Dang and Sunayana presented a pleated black body-con dress styled with a broad waistband, Anavila created a pleated blouse and skirt in indigo and deep green and Bodice used the technique on dresses, skirts and jumpsuits. Asa Kazingmei’s looks, from start to finish, were strong and made a lasting impression with their biker-inspired accents. Titled Bionic, his collection was heavy on frayed patches, multiple pockets, zippers and tabs and, textured trousers. Large square checks in monochrome were seen across collections. Bengaluru-based Latha Puttanna’s grey silk organza sari with golden checks turned heads, as did Sailesh Singhania’s off-white and golden lehenga, worn by showstopper Aditi Rao Hydari. As far as colours go, it was yellow that was the order of the day. Varun Bahl stunned audiences with a slinky yellow sari bearing golden floral prints, while a pleated, floral-printed lehenga and embellished bralette in marigold from Anita Dongre’s collaboration with Tencel, also proved to be a hit. 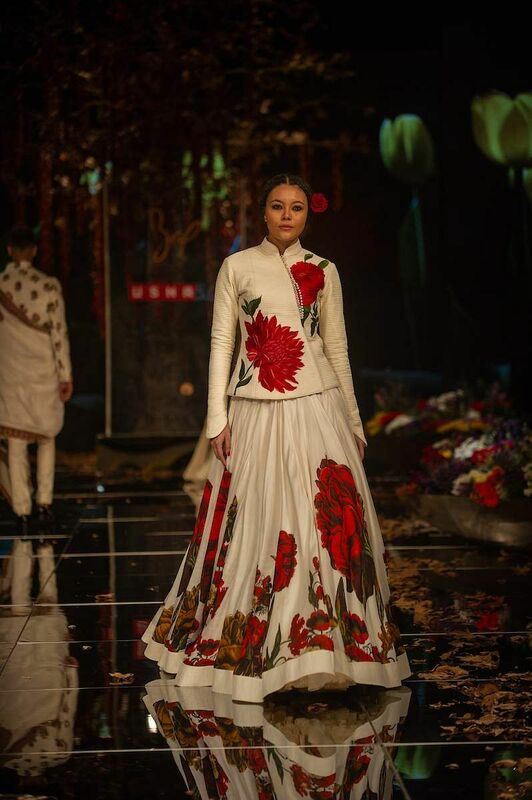 Guldastah by Rohit Bal was the result of a collaboration with women from the Usha Silai cluster of Kashmir and it highlighted the craft forms of the region. There were floor-length kurtas, short flared blouses and capes. But a defining look was a white quilted jacket with giant red dahlias. 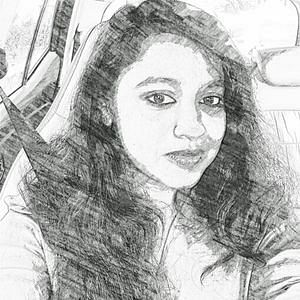 Lace may have taken a back seat when it comes to mainstream fashion, but it seems Isha Dhingra of Aikeyah is single handedly attempting to bring it back. And if we were to go by her collection, Summer 2019, we wouldn’t be surprised if she does. Working on an all-white colour palette, the outfits had lace inserts, hems edged with lace and lace-trimmed collars. 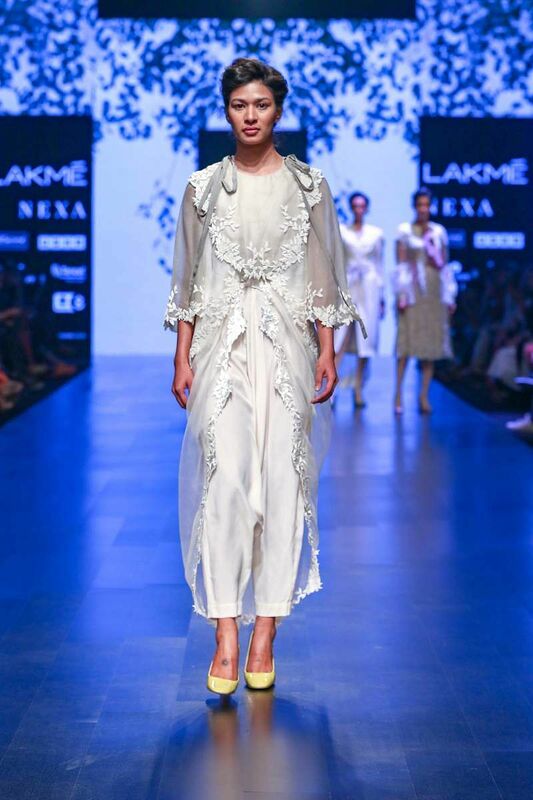 Saaksha & Kinni and Shivan & Narresh, made a strong case for flowing sheer jackets. Using fabrics like cotton silk and organza, the former’s jackets featured abstract floral prints in shades like brown and yellow. The latter set the catwalk on fire with an amber jacket championing the art of tholu bommalata (leather puppetry) from Andhra and pattachitra from West Bengal.